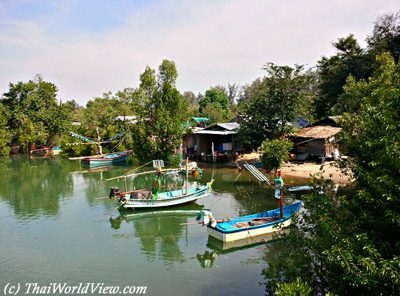 Many fishermen traditional villages are worth visiting around Bang Saphan area. 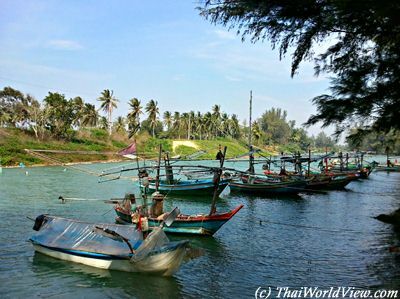 It is a nice opportunity to see their traditional way of life and support local community by buying their fresh fishes. 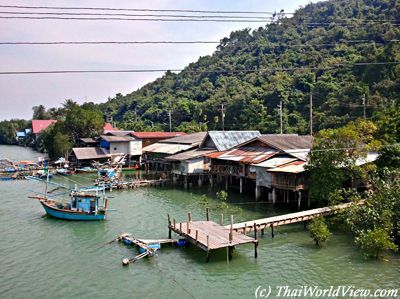 Many fishermen villages can be seen along the sea in Mae Rum Pueng Bay. 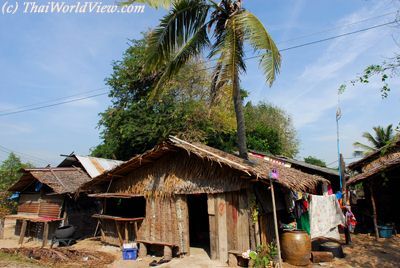 Some villagers still own many poor wooden houses. It can be very scary in case of big storm. 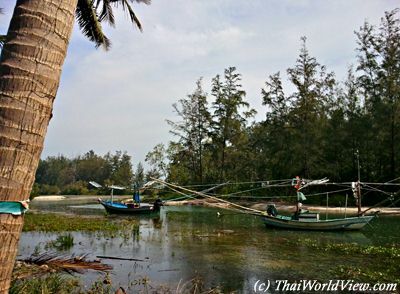 Some days due to strong wind, small boats cannot go out so no fishes can be seen drying. 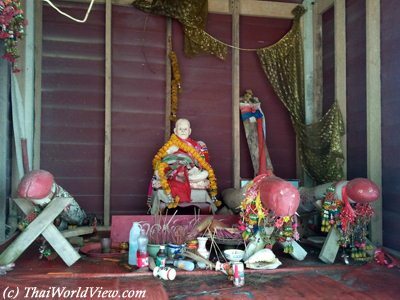 This deity shrine protects the fishermen boats while going to the sea. It includes phallus as fertility symbol. 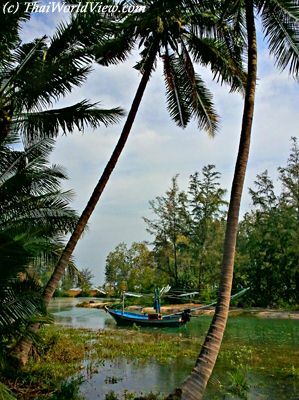 Small canal has been created behind the beach to host safely the fishermen boats, avoid the waves and wind. 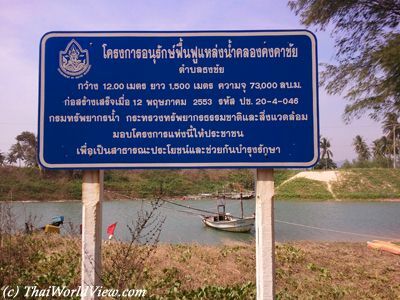 This canal is 1500m long and 12m large. It was opened in year 2010. 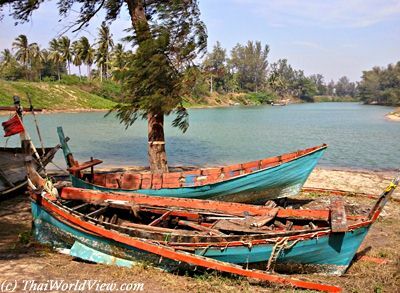 Old stranded and abandoned fishing boats always offer nice opportunity for pictures. Burmese fishermen are certainly working around as energetic drinks advertisement in Burmese script could be seen. 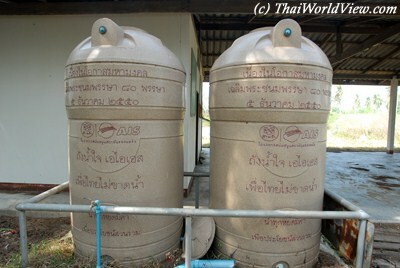 Those big water containers have been offered to fishermen community by company AIS. 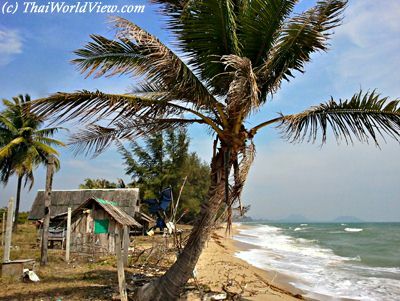 During December and January, the wind is quite strong with many waves. 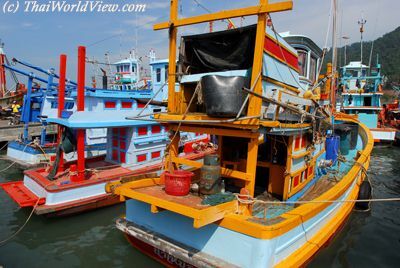 Many small fishing boats stay in shelters. 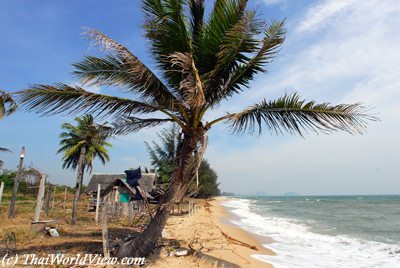 Fishermen boats, palm trees, sun, blue sky, sea offer great picturesque views around Bang Saphan. 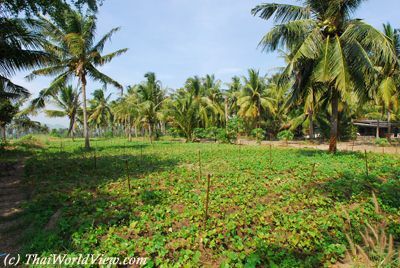 Local fishermen are also cultivating various vegetables to complement fish diet. 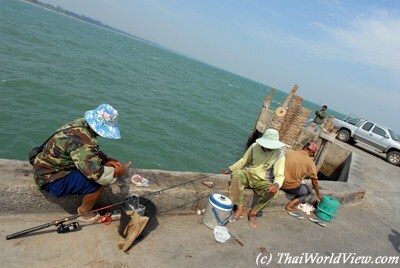 Many Thai fishermen are always hanging around Bang Saphan's jetty. 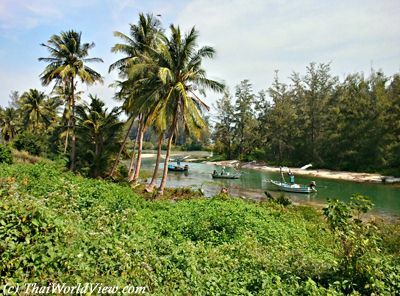 Some of them have very good skills or technics as they are able to catch many fishes. 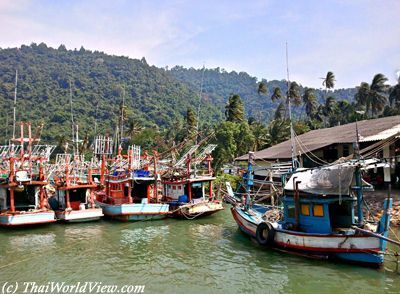 Fishermen villages are often located in calm areas such as bay, which can be used as shelter for boats. 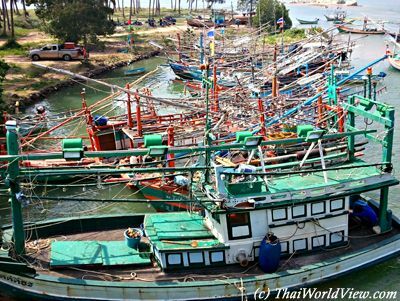 Squid fishing boats only leave at nighttime as they use big lights to attract squid. 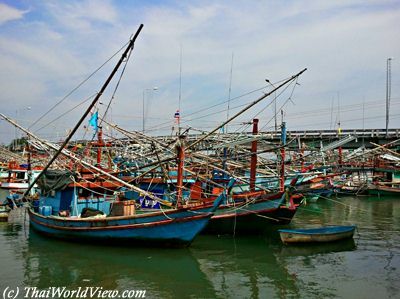 This is a busy sea shelter with many colorful fishermen boats tied together. 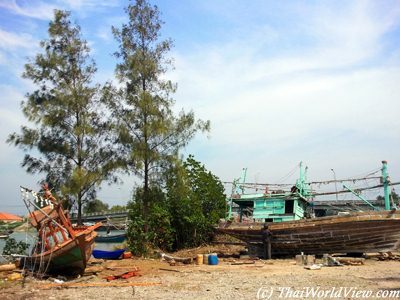 This area features many boats and is part of Bang Saphan Bay Community-based Fisheries. 30 years boats are still used and repaired whenever holes or cracks appear in the shape. 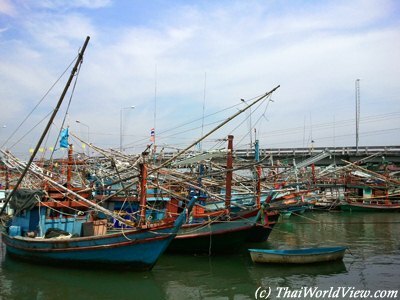 This is a busy seaport with many colorful fishermen boats tied together and boat restoration activities. 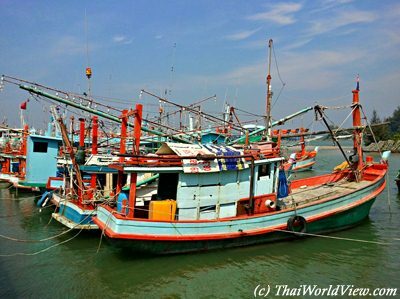 Bang Saphan seaports feature small, medium and big fishing ships so the overfishing issue remains an opened issue. 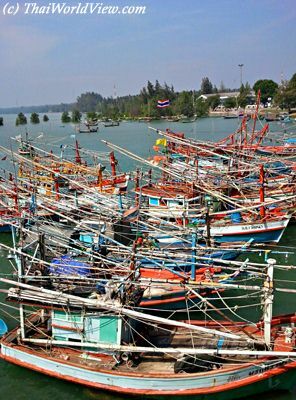 Stories of Burmese / Cambodian workers enslaved on Thai fishing boats often appear in the international news. 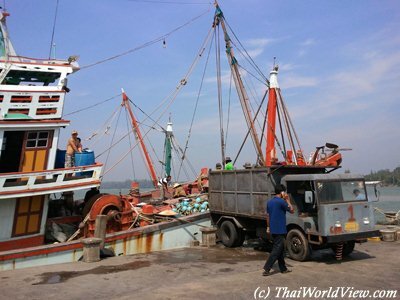 Big boats are coming back from deep sea. 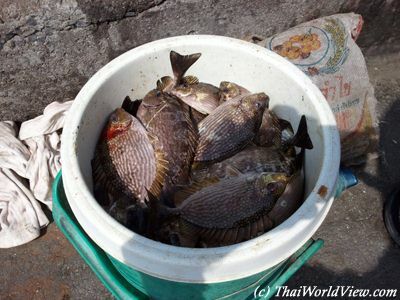 Fishes are stored with ice in the boat trunk. 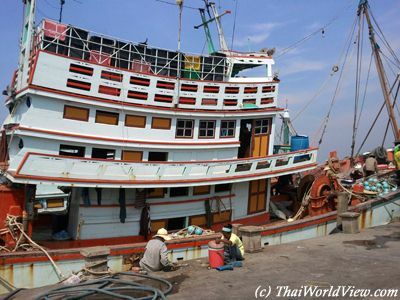 There are about 150 000 men working on the Thai fishing boats. 40% of them are using foreign labor. 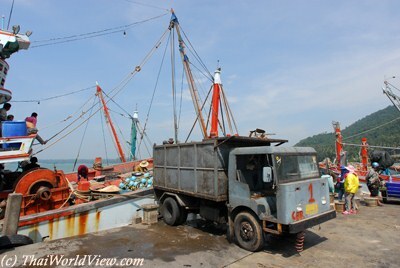 A small truck is carrying the fish from the pier to a bigger refrigerator truck. 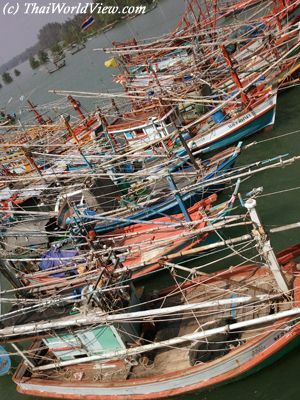 Some fishing boats are able to stay at sea for long periods thanks to a network of boats. 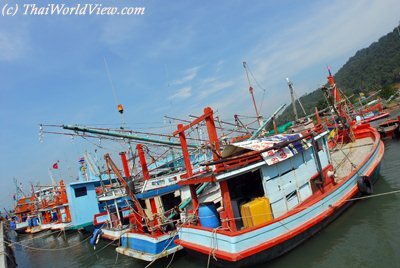 Those smaller boats pick up the fish and deliver basic necessities to allow fishing boats going on. 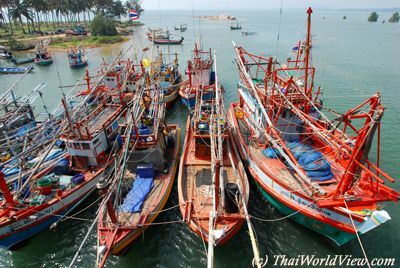 Thai fishing fleet is one of the biggest in the world and supplies many big countries such as Britain and USA. 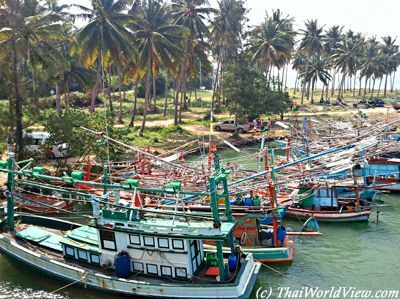 According to Thai government, over 90% of Thai fishermen work in small-scale fisheries and depend on the fishing industry for their livelihood. 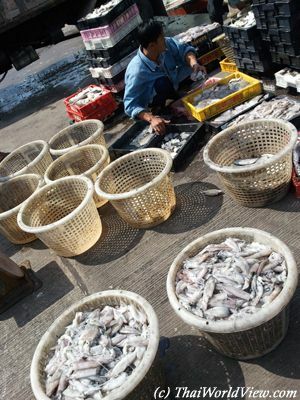 Due to overfishing issue, Thailand has also shifted to aquaculture production and now ranks 5th in the world. 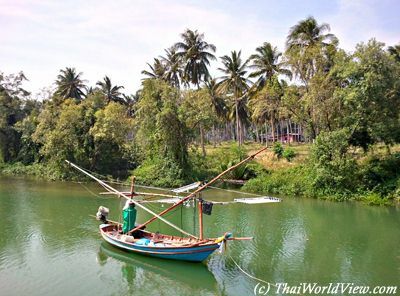 Fishing is a huge industry for Thailand. 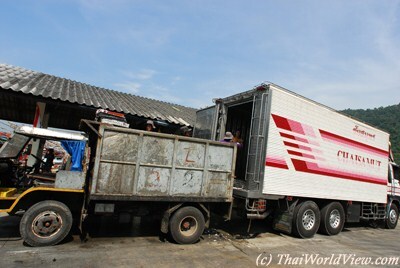 Thailand ranks 3rd in the world for exports. 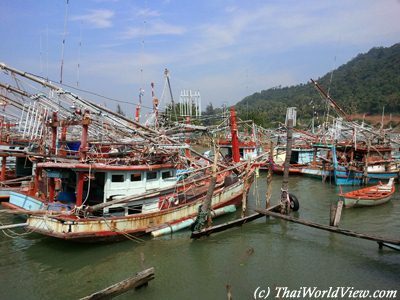 Thailand's fishing industry uses a big portion of migrant labor from neighboring countries. 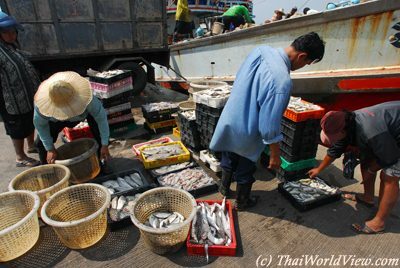 Jobs on the ships and in the fish processing plants are shunned by Thai people.